Revealed: Audi A5 and S5 Cabriolets | What Car? Have a first look at the Audi A5 Cabriolet that will go on sale next spring. 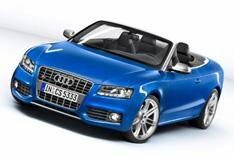 The car, which replaces the Audi A4 Cabriolet, uses a traditional fabric hood rather than a metal hard-top. The roof opens in 15 seconds and closes in 17. The cloth roof helps save boot space, with just 60 of the 380 litres being sacrificed when the roof is open. With the rear seats down there is a total of 750 litres of space. UK prices have not been released, but in Europe they will start from around the equivalent of 31,500. Five engines will be available at launch: three petrols and two diesels. The petrols are 178bhp and 208bhp turbocharged 2.0-litre units and a 261bhp 3.2-litre V6. The diesels come as a 187bhp 2.7-litre and a 237bhp 3.0-litre. A six-speed manual gearbox comes as standard with the petrol engines, although buyers can specify Audi's semi-automatic S tronic system for the higher-powered 2.0-litre and the V6 petrols. A CVT gearbox is also available as an option on the petrol models. The higher-powered diesel has S tronic fitted as standard. Audi is billing the A5 Cabriolet as a four-seater, saying that it provides plenty of legroom because it has the longest interior of any car in its class. Standard equipment includes 17in alloy wheels, air-con, and audio system with a CD player. Options include leather seats with a special coating to keep them cool in the sun, sports seats, electric seat adjustment, xenon headlights, and optional neck-level heating. Audi Drive Select, which allows the driver to switch between three engine maps that control throttle and gearbox response as well as the car's steering, is available as an option when a sports differential, adaptive shock absorbers or dynamic steering is ordered. A high-performance S5 model will also go on sale with a supercharged 328bhp V6 engine. The S5 will travel from 0-62mph in 5.6sec. It averages 29.0mpg. Sport suspension, 18in alloys, an S tronic gearbox and four-wheel-drive are fitted as standard, while a sport differential can be added.